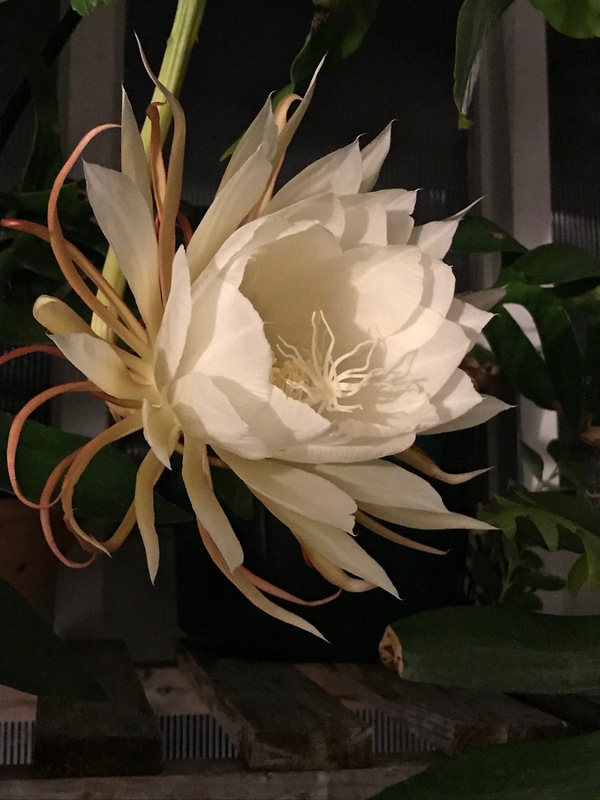 Two nights ago my friend Marlene’s night blooming cereus was blooming again. It’s quite a spectacular site – the flower begins its display around eight in the evening, slowly opens over a couple of hours, around midnight it develops a wafting scent (to attracts the bats that pollinate the flower), by three in the morning it has begun to fade, and it’s finished blooming around dawn. I took this photo around 9:30. 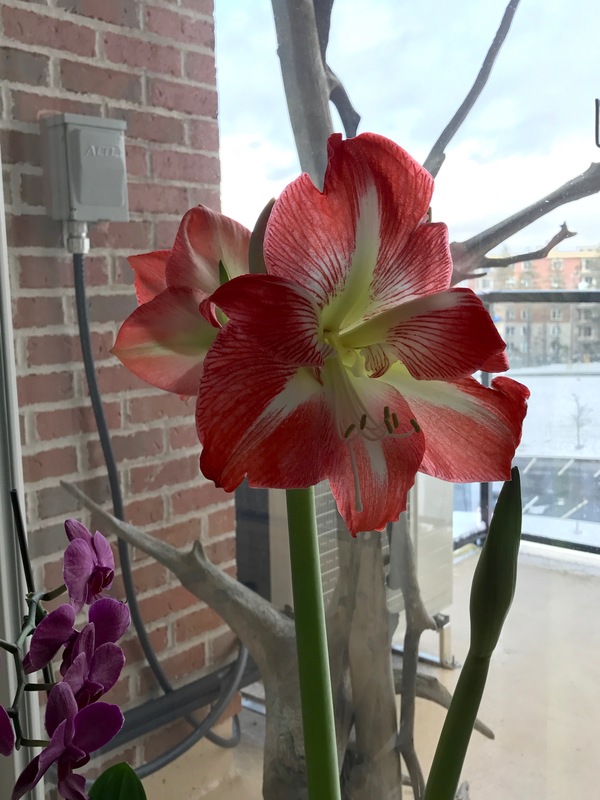 The flower isn’t fully open; the outer petals will expand further creating a flat disc around the cupping petals. But you can see the glory of the bloom even at this stage. 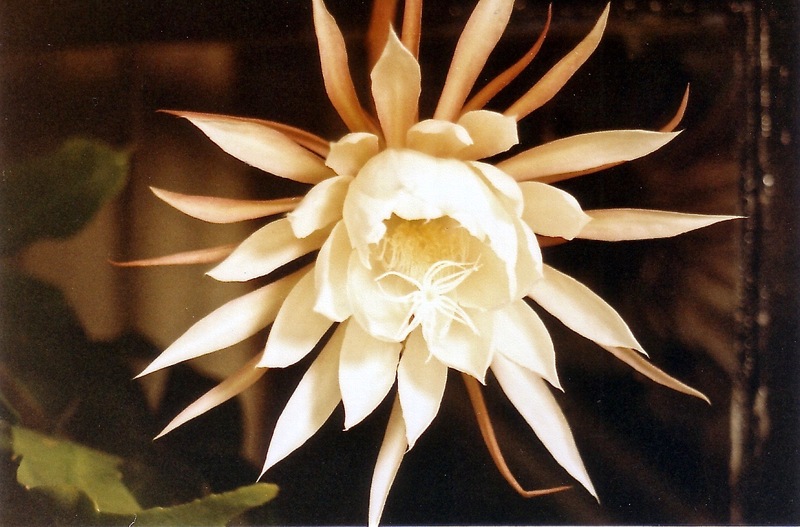 Here is a photo of the first time this cactus bloomed (I don’t have the exact year mid to late 1980s, likely) – just before it was fully open around midnight. We spent that evening in the garden, sipping wine, watching the flower open. No bats, sadly, to pollinate it. I had enlargements of the photo printed to commemorate the occasion. I still have the print hanging in my home. I’ve heard nothing but griping about winter for the past week. I’m not among the gripers. That’s because I’ve been keeping records for 30+ years on the first appearance of Forsythia and Coltsfoot in Halifax. 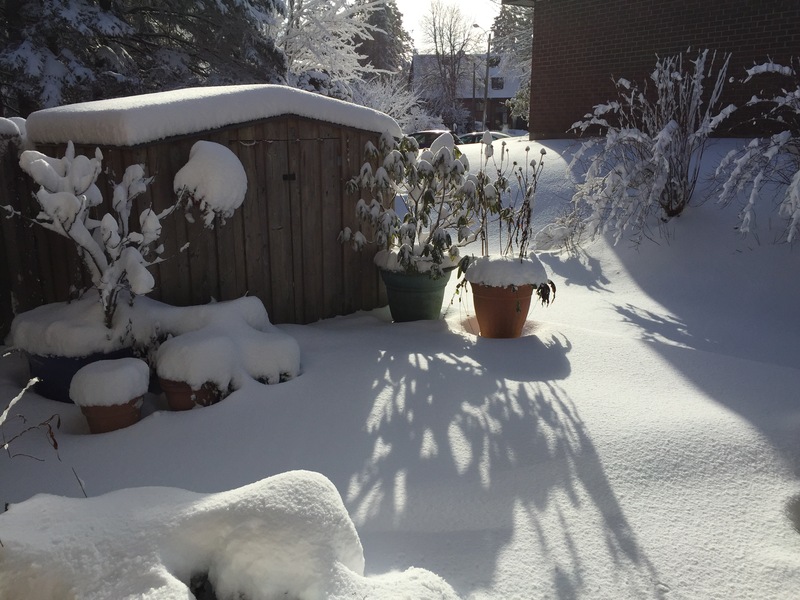 We’re still in the grips of winter – two snow storms in the past ten days. Strong winds, freezing rain. I understand that the time has changed and the calendar has passed March 21 but guess what — we can expect at least another month of “winter” here! When I started keeping track more than 30 years ago, the first Forsythia – those bright yellow shrub flowers, the first we see in spring in Halifax didn’t show up until close to the 20 of May – the earliest I recorded Forsythia up to 1992 was May 16. From 1997 to last year that date slowly shifted – from May 12 to around May 2. In 2015 I recorded some Coltsfoot and Forsythia on May 2. 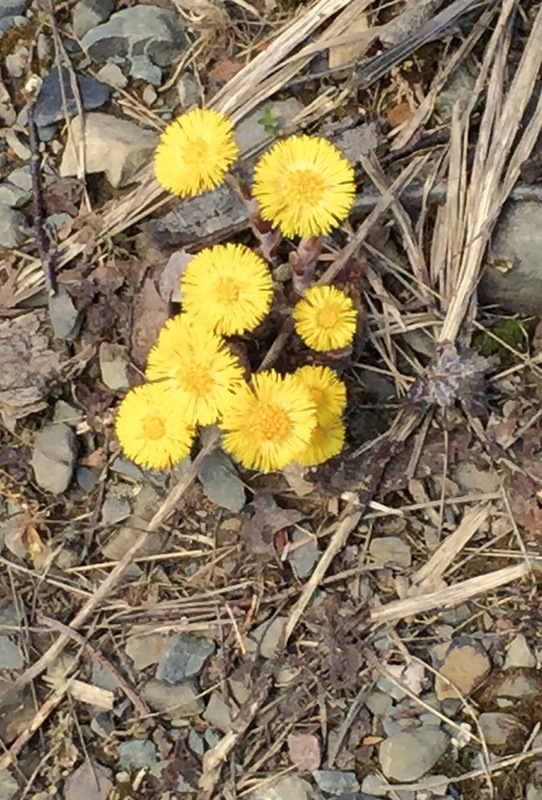 Last year I actually saw some Coltsfoot and Forsythia on April 27. That’s still a month to go. 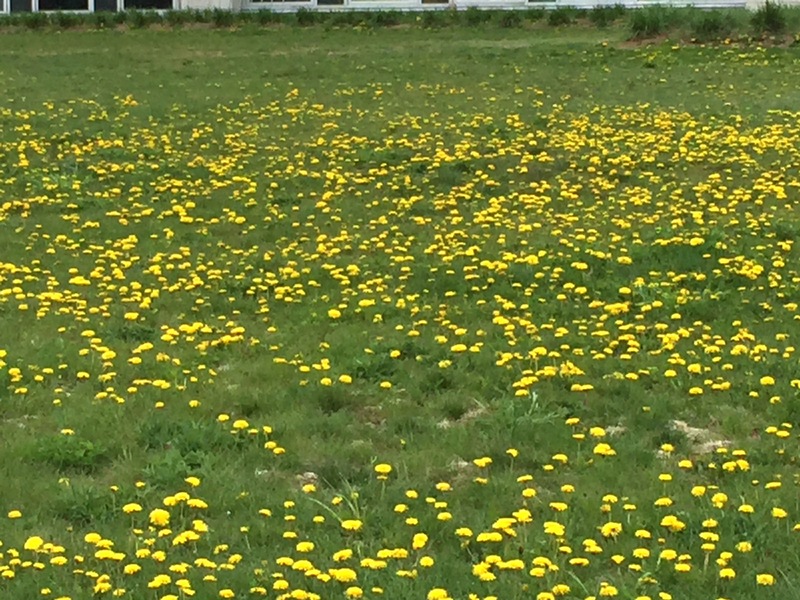 We can’t expect to see Dandelions in bloom until around May 24 in Nova Scotia. So there’s no point in griping – enjoy what sunshine we’re getting. Be sure to put on a warm jacket. The calendar may say “spring” but Spring won’t arrive in Nova Scotia until the very END of April – even with the changing climate. A wonderful warm day – 20 C in my part of the city. The first so far. Buds on the trees are fattening, the hosta is beginning to show, and the patch of crocuses that have survived are open! 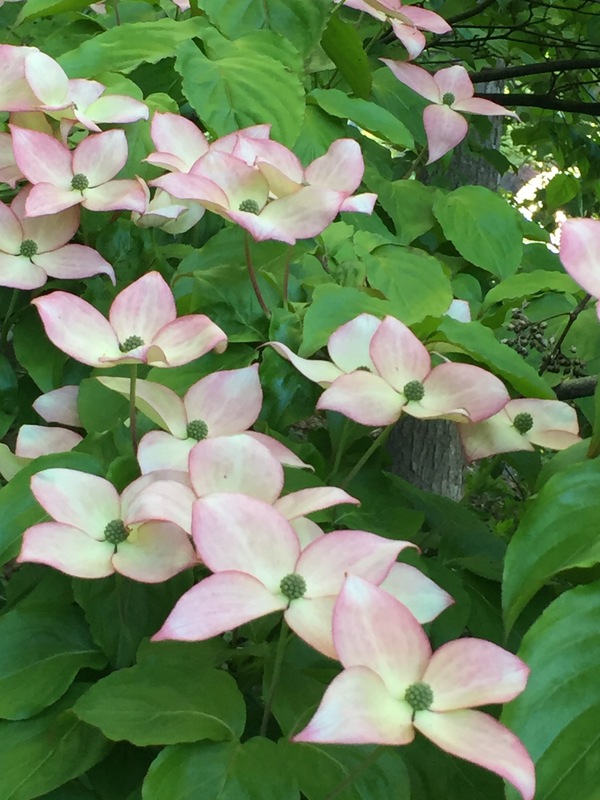 I will need to plant a whole lot more in the fall in spots that are sunnier than this spot – they make me smile and feel hopeful that the season is really changing. This is my back deck just after our second snowfall last week. Both snowfalls were wet and heavy but the undisturbed expanse looks lighter. It won’t all melt before our next storm arrives whenever so the snow will continue to accumulate. Let’s hope I don’t get the accumulation I experienced last winter!